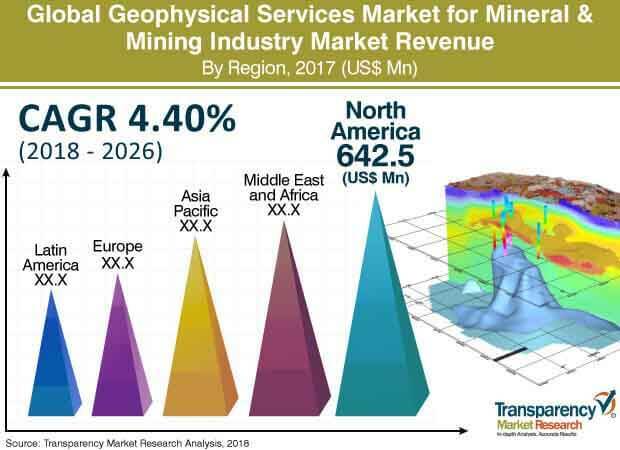 The global geophysical services market for mineral & mining industry was valued at US$ 2,121.6 Mn in 2017 and is anticipated to expand at a CAGR of 4.4% from 2018 to 2026 according to a new report titled “Geophysical Services Market for Mineral & Mining Industry - Global Industry Analysis, Size, Share, Growth, Trends, and Forecast, 2018–2026” by Transparency Market Research (TMR) Mining is the extraction of valuable minerals or other geological materials from the earth. It is usually done from an ore body, lode, vein, seam, and reef or placer deposit. The deposits then form a mineralized package that is of economic interest to the miner. Rise in mining activities is encouraging operators to explore the geological areas for the presence of minerals. This is driving the geophysical services market for mineral & mining industry. ? Geophysical services have been bifurcated into aerial-based and land-based geophysical surveys. Land-based geophysical services play a vital role in the exploration of various minerals, hydrocarbon sources, oil and gas reserves, etc. These surveys also help understand geophysical conditions of the ground surface and sub-surface. Aerial-based survey captures images by using fixed-wing aircraft and helicopters. Newly developed state-of-the-art geophysical services for mineral & mining industry treatments offer better reliability with efficient results for the mining industry. Increase in investments in mining and exploration is a key factor boosting the demand for geophysical services across the globe. Growth in demand for precious metals such as gold, platinum, titanium, and silver is expected to augment the demand for geophysical services in the near future. The mining industry accounts for significant share of gross domestic product and exports in Russia. Excavation of precious metals such as copper, iron ore, lithium, potash, gold, and niobium has been rising. This is creating opportunities for the geophysical services market for mineral & mining industry in Europe. Countries such as Mexico, Brazil, Ecuador, and Chile in Latin America have become hotbed for mining in recent years. In 2017, 305 companies invested US$ 2.38 Bn in exploration of precious metals and minerals across Latin America. This has boosted the geophysical services market for mineral & mining industry. The U.S. Environmental Protection Agency (EPA) proposed a framework such as National Emissions Standards for Hazardous Air Pollutants (NESHAP) for gold ore processing and production facilities in order to curb environmental pollution caused by the harmful effects of excavation. It aims to curtail the mercury emissions caused by gold mining. Currently, North America is a leading region in terms of utilization of geophysical services for mineral and mining. The region constitutes large share of the global geophysical services for mineral and mining market. The market in the region is expected to expand at a moderate pace during the forecast period. The U.S. is one of the leading producers of coal extraction. Coal excavation accounts for 17% of global production of coal deposits. About 1 billion tons of coal is produced annually in the U.S. This is augmenting the demand for geophysical services for exploration purposes. The global geophysical services market for mineral & mining industry is highly competitive. Leading players dominate the market. Key players operating in the market include EON Geosciences, Dawson Geophysical Inc., Geotech Surveys, TGS, Phoenix Geophysics, SEA GEO SURVEYS PVT LTD, and Geophysical Survey Systems, Inc.